Rehabilitation of 1920s, 566-seat theatre fortified its inclusion in the National Register of Historic Places List and served as a catalyst for revitalizing a historic downtown neighborhood. The building was a key performance space for African-American jazz artists and sat vacant for almost four decades. 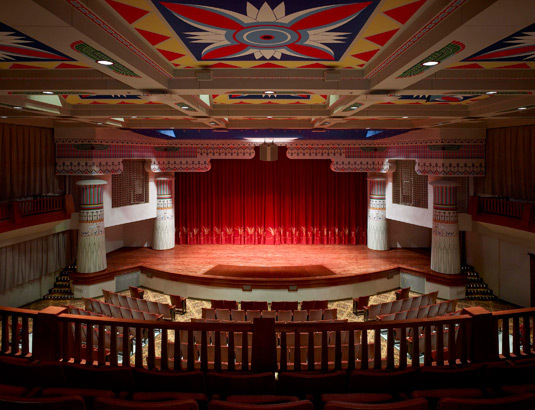 In a 2007 facility assessment, AD’s team helped identify challenges and opportunities for its renovation to serve as a multi-use performance auditorium and collaborated design modifications to maintain the Theatre’s historic integrity. Acoustic design spanned the main stage theatre with anticipated use for both live arts and cinematic presentations with the addition of a new digital projection system. Recommendations included modifications to the second floor ballroom to accommodate use by resident arts groups for auditions, rehearsals, performances and classes and the third floor space which is home to the Jazz Arts Group’s Jazz Academy. AV technical system design addressed the desire to enable the theatre to serve as a recording studio for both video and audio productions. Technology infrastructure was intentionally designed to accommodate additional recording equipment purchases and upgrades over time. A/V technical systems design was also provided for the entry/lobby and backstage support areas. The renovation included sustainable design practices in compliance with City’s “Green Initiative.” The project received a 2009 Ohio Historic Preservation Office Merit Award and the 2010 Heritage Ohio award for Best Public Rehabilitation. Once the key venue for jazz, the revitalized Lincoln hosts a myriad of events including concerts, touring theatrical productions, poetry readings, film and lectures. While the aesthetics of the theatre’s heyday is captured, space acoustics and AV system design enhanced functionality to meet 21st Century performance needs and reinforced the building’s support spaces to more effectively serve as a resource for community event needs.